The Macclesfield Canal runs for about 27½ miles from its junction with the Peak Forest Canal at Marple, via 12 locks at Bosley, to its junction with the Trent & Mersey Canal at Kidsgrove. It passes through beautiful countryside, and touches on several towns – Bollington, Macclesfield, and Congleton. For more details see About the Canal. The Macclesfield Canal Society, formed in 1984, has currently about 130 members, who mostly (but not exclusively) reside in the Macclesfield area. Its aim is to promote the canal by means of liaison with local authorities, the Canal & River Trust and the Inland Waterways Association (IWA). Also leading several local canal adoption groups such as the MAG-Macclesfield Adoption Group , BLAG-Bosley Locks Adoption Group , PAG-Higher Poynton Adoption Group, CAG-Congleton Adoption Group plus a Roving Task Force Team ...this covers the other areas of the canal. 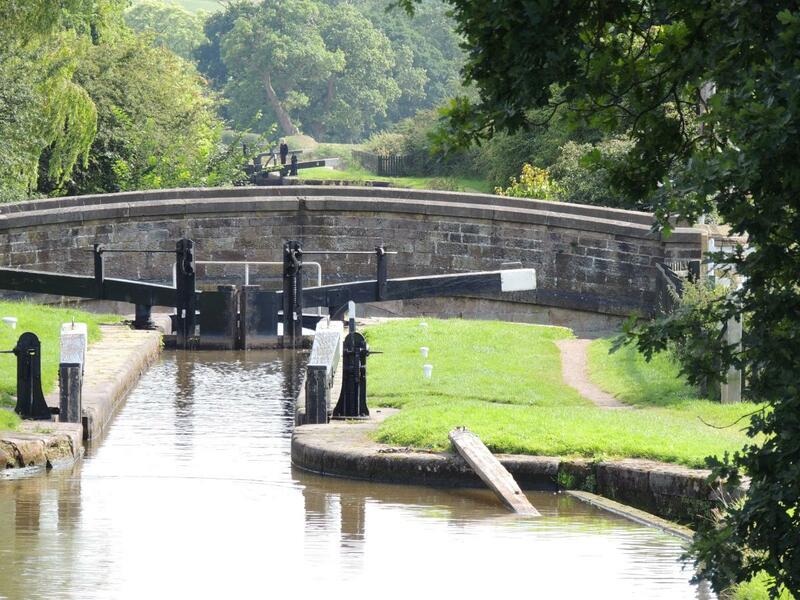 In Addition the MCS Teams liaise and work with other Adoption Groups on the Macclesfield and Peak Forest Canals. The Society holds monthly Meetings on the second Thursday of the month, September to May, when a speaker, usually from outside the Society, gives a presentation, often illustrated, on a subject related to canals, or of interest to canal enthusiasts. These meetings are held at The Silk Trader (pub), Brook Street, Macclesfield SK11 7AD, and start at 7.45pm. These meetings are free to members, but visitors are always welcome(we would ask for a donation from visitors please). For details of future meetings, see [Meetings Program-News Section]. In conjunction with other bodies, outlined above, the Society engages in Work Parties when required, to carry out such work as tidying or repair of the towpath, pruning canal side vegetation. This work has included re-instatement of towpath features, such as benches or mooring rings. Work parties at Bosley Locks are enhancing the location by provision of a herb garden at Lock 5, and re-instatement of the Lock-keeper’s garden at Lock 11. In recent months the Society has supplied and erected Information Boards at selected points on the towpath in the Macclesfield area, re painted the Dane Aqueduct plus numerous activities arranged via the Adoption Group Teams along the canal length....we are currently working on our plans for work in 2019. Earlier projects have included the re-instatement of the Milestones, the repair and repainting of the ornamental towpath railings at Ramsdell Hall (Scholar Green); the repair of Bridge 47 (Lyme Green); the rebuilding of Bridge 30 (Macclesfield). In the last 12 months we have re painted 6 bridges , and put up many bird boxes , prepared Ramsdell Hall for painting in 2019, cleared vegetation, laid gravel on towpaths using the Adoption Groups along the canal (for details see Calendar section), in addition we continue to work on one of the main Bosley Feeders (Radcliffe) clearing vegetation and silt from the gate valves to try to ensure we have suffiecient water in the 2019 season. Walks, usually with a canal related theme, are arranged from time to time – watch the Calendar for details. HALOUS (Have A Lock on US), a popular event is held every August Bank Holiday, where Society members and friends operate the locks at Bosley for the benefit of passing boats. This is the Society’s principal means of raising funds to support the work of the Society. An illustrated quarterly magazine ‘Milestone’ is published by the Macclesfield Canal Society, and is free to members. This contains reports of monthly meetings, and articles of interest supplied by members, as well as details of forthcoming meetings and work parties. The Society publishes a Map Leaflet, showing the whole length of the canal, and indicating useful facilities and points of interest along its length. This is available from Map Boxes (accessed using a CRT key) which are located at Marple, Bosley Top Lock, and Hall Green Lock. A contribution to support the production of these leaflets is requested from those who take a copy. Membership of the Society is open to anyone who shares the aims of the Society. The membership fee is only £10 per year, please contact the Membership Secretary (email: membership@macclesfieldcanal.org.uk) for further details. secretary@macclesfieldcanal.org.uk, or (snail mail) 5 Ridge View, Macclesfield, SK11 8DB. Canal & River Trust Tel. 0303 0404040.